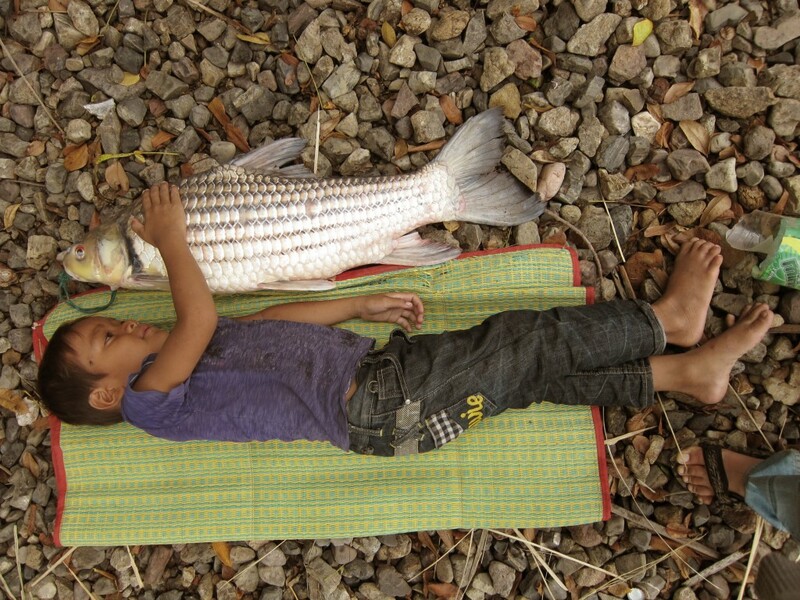 A young boy poses with fish from the Mekong River in Si Phan Don, Chapasak, Southern Laos. Photo by Dorn Bouttasing. This image was presented as part of the “Mekong, River of Life” exhibit in Chiang Mai, Thailand, July 23–27 2017. In light of recent news reports of intimidation, the International Accountability Project stands in solidarity with Dr. Chayan Vaddhanaphuti and the four conference attendees who are currently facing criminal charges for allegedly violating the ban on public assembly during the Thai Studies Conference. IAP calls on the charges to be dropped immediately and affirms the right to assembly and rights of academics to freely express their opinions without fear of persecution or censorship from the State and/or other actors. More information available here. What would happen if the Mekong river stopped flowing tomorrow? This was the question I considered as I tried to communicate the crisis facing the Mekong to 1,500 scholars, researchers, and activists who had gathered for the recent 13th Thai Studies Conference (ICTS13) and the International Convention of Asia Scholars (ICAS) in Chiang Mai, Thailand. 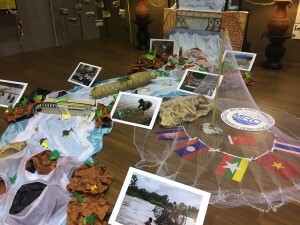 The two events, hosted by Chiang Mai University, brought together people from around the world who were interested in reviewing and evaluating the existing landscape of knowledge in Thai studies and Asian studies. The Mekong River, which flows from the Tibetan Plateau to the southern part of China to Myanmar, Thailand, Laos, Cambodia, and Vietnam, is central to the lives and livelihoods of millions in the region. In recent years, the Mekong has been subject to a massive infusion of investments by public and private international development financiers to build so-called development projects such as large hydropower dams. The projects are likely causing irreversible impacts to fisheries and biodiversity. So far, decision-makers have largely failed to ensure transparency, accountability and public participation in the design and implementation of projects. If we do not act soon to support Mekong communities, millions may very well lose their rights to food, livelihood, and a healthy environment. The River — presenting stories of lives, cultures, and ecosystems of the Mekong people from upstream to downstream. The Devastation — reflecting problems and human rights impacts of regional large-scale development trends such as hydropower dams and rapids blasting. 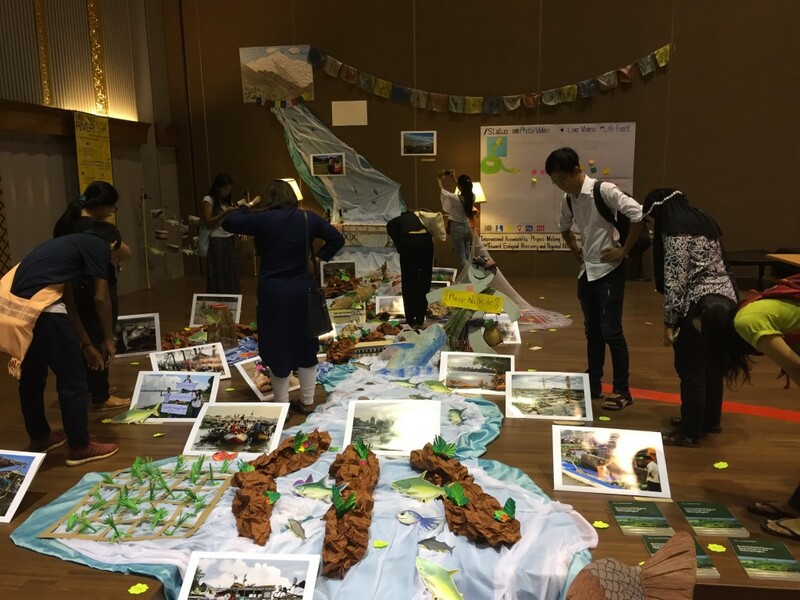 The Movement — recognizing grassroots struggles to protect the Mekong river and the local and regional social movements seeking justice for the Mekong and those impacted. The images traced the course of the Mekong, from its source in the Tibetan plateau to the mouth of the river in Vietnam. Over the course of a week, we welcomed visitors from a diversity of backgrounds and countries. 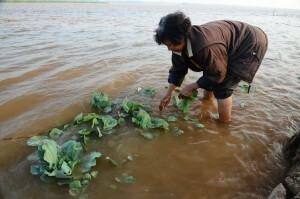 Many had never seen the Mekong before and were alarmed to learn about the current situation. People reacted differently to different parts of the exhibit. Many visitors were glad to see a representation of Tonle Sap lake in Cambodia, which is also the largest lake in Southeast Asia. They shared their memories of trips they had taken to the lake. Another group of young children asked to take home paper cutouts of fish found in the Mekong. Fish populations have depleted so drastically in recent years, that it is difficult to encounter them in person. In fact, we had to rely on images shared by local communities to create an accurate representation. Other visitors expressed concerns over plans to construct dams and make the Mekong passable to large, commercial cargo ships traveling from China to Laos. The plans would demolish rocks and islets occurring naturally along the river and permanently alter its course. One visit in particular stood out from the rest. “Can I walk in?” asked a woman who stood hesitantly at the entrance of the exhibit. Once inside, she asked if it would be okay to touch the images. Her questions made me think about the concept of ownership and who has the rights to use and access common resources like a river. 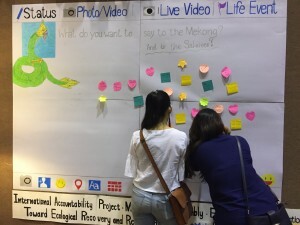 For those of us who organized the exhibit, we strongly believe the Mekong should belong to everyone and anyone should be able to interact with it as long as they don’t cause any harm. On behalf of the organizers, IAP would like to extend our gratitude to the Regional Center for Social Science and Sustainable Development, Chiang Mai University, for the opportunity to participate in the conference. Our exhibition would not have been possible without our team of volunteers from Stateless Youth Leaders Network. We appreciate our friends and colleagues who contributed their stories to make this exhibition possible. Information: This blog first appeared on IAP’s medium.